On our last trip, during one of the many meals made for us, Josh and I told our weaving friends in Ban, Laos, that we would have to make them a meal – an “American” meal – the next time we came to visit. So, this time, although traveling solo, I brought an American “farm breakfast” to share. Maren hold the coffee filter while Phut stirs. 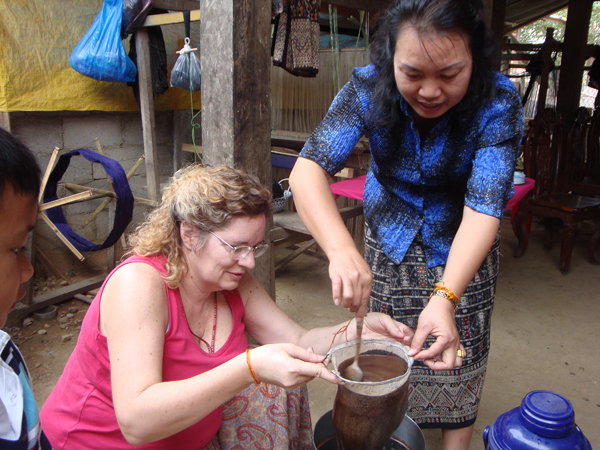 Traditional Lao coffee, which is not readly available in the north, is sweet and thick, very different from our breakfast java. First was deciding on Snoqualmie Falls pancake mix – one that did not require fresh milk or oil to be added; neither of these are readily available (or fresh) in rural Laos. I had scoured our local Goodwill for a pancake turner,a stainless steel frying pan and a dozen forks, and also bought a package of paper plates, as Lao peple usually eat from bowls. I bought three packages of bacon, froze them with 8 small flat ice packs wrapped in layers of insulating newspaper within a securely-taped box. Of course, I also invested in a quart of real maple syrup. Customs checked the bacon package, as I imagined they would, as it was re-taped with customs and border patrol tape. As a precaution, I had written on the box ”Contains bacon, 8 freezer packs, and a handful of ice pops (I didnʼt have enough freezer packs). If opened, please rewrap carefully to keep frozen”. It worked! The bacon arrived in Ban, 3+ days after leaving home, still somewhat icy. 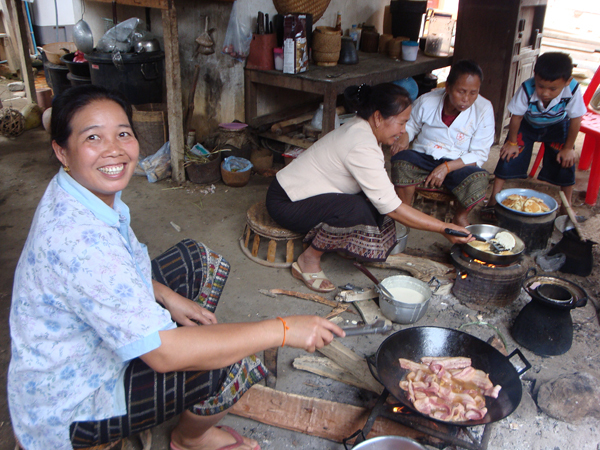 Souk, a master-dyer and weaver, cooks up the bacon. The smell brought the village calling! So, breakfast morning, a fire going, I laid out strips of bacon in a large wok and the heavenly smell brought everyone to the fire – soon other women from the village joined us – and the pancake mix was opened. Another fire was lit. The old Revere Ware frying pan worked great over the fire. 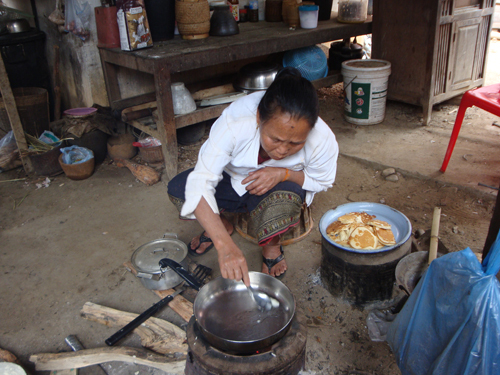 Mrs. Bunkeo and Sukkhavit (see Newletter #5) were in charge of one pan of pancakes, greasing the pan each time with lard. Souk cooked the 4.5 lb of bacon in 3 batches; Mai, Phut, and others took care of the fruit salad; Phuey cracked and wonked up the eggs for scrambled eggs. Everyone laughing, participating, having fun – boy isnʼt that the way to cook! Then, Phut and I made coffee – a pound, ground, of our usual French roast from Market of Choice in Eugene, and then she and I served coffee with sweetened condensed milk. The men stood outside chatting (and sniffing) while the women cooked. Mai (center), our dear friend and translator, grew up in Ban with Souk and other silk weavers and dyers as her best friends. Mai was the one able to go to college, learn English, and engage in a “Western-style” career. 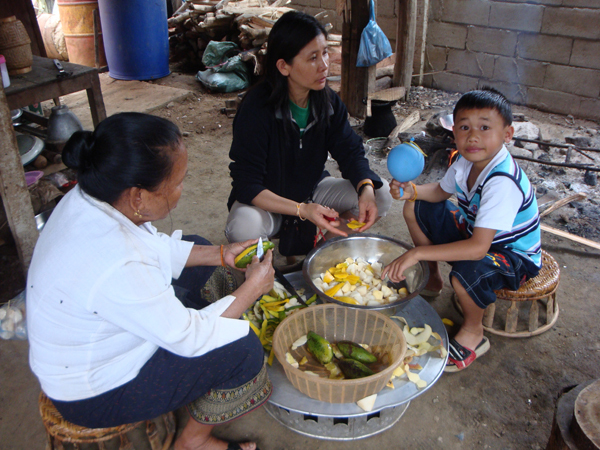 Her son, Bingo (right) and Sukkavit, Maiʼs aunt and a village elder, help with fruit salad. Mai visits Ban rarely, and thus her presence assures a celebration. Serving time: I had put forks on the big table, and had to stop Soukʼs husband from putting bowls out for everyone at their places. “Bo, bo, bo” (no, no, no), I said. Surprised look. I pointed to the paper plates, and all of the food on one side table, and had Mai translate that they were going to eat American style. Everyone laughed. “It is like this table is in America,” they said. They each served themselves, buffet style, with scrambled eggs, fruit salad, bacon, and pancakes, and I poured maple syrup on the first few peopleʼs pancakes for them. I donʼt think they really believed the maple syrup came from trees. The townʼs key weavers (and husbands) thought it was hysterical that they were expected to eat with American table manners and a fork. Perhaps an IHOP would do well here? The first few people sat down at the table to eat. “Bo, bo, bo,” again, I said to Phut, who was eating her pancake using her fingers. “In America, we eat only with forks, not with fingers” and I showed her how to cut her pancakes with the side of her fork. I had to correct several other people on fork etiquette before the meal was over. All was met with hilarity and jibes at the person caught with Laos instead of American tables manners. The volume of conversation and laughter was so high, I told Mai it seemed like the coffee was working on everyone like lao-lao (the local rice whiskey). More gales of laughter, and Soukʼs husband was all the more grateful that I gave the extra ground coffee to him. Everyone cleaned their plates. Several people went back for seconds, including Phutʼs husband, who had a full second course. Everyone said they loved the meal. One person said, and others agreed, that they had eaten American food before and not liked it, but they really liked this meal. One person said that he would like to eat like this every day. I told him, no, he wouldnʼt like that because it would soon make him very fat. Again, hoots of laughter. Sukkavit melts lard in the Revere Ware pan in preparation for more pancakes. They insist now that we bring more meals to them. I asked Mai to tell everyone that Josh and I would bring a dinner next time, which prompted her to tell everyone that this was breakfast food, and lunch and dinner food were different, much to the amazement of all. Mai knew that other cultures ate different food at different meals, as she had been to Japan to get her Masterʼs degree, but no one else knew that. In Laos, the same food is eaten at every meal, depending only on what is in season and currently available in the market or garden. All in all, an excellent cultural experience for our Laos friends and for me; quite the difference from the previous dayʼs meal which had included raw fish laap, a plate of “pig eggs” (a pig had been butchered that day, and I really didnʼt want to ask too many details about what “pig eggs” consisted of…), and other local delicacies. After it was over, Mai claimed the frying pan, Souk claimed the pancake turner and forks, and requests (orders?) were made for additional utensils to be brought next time. Needless to say, we ran out of syrup…. This entry was posted in Travel Ventures by josh. Bookmark the permalink.